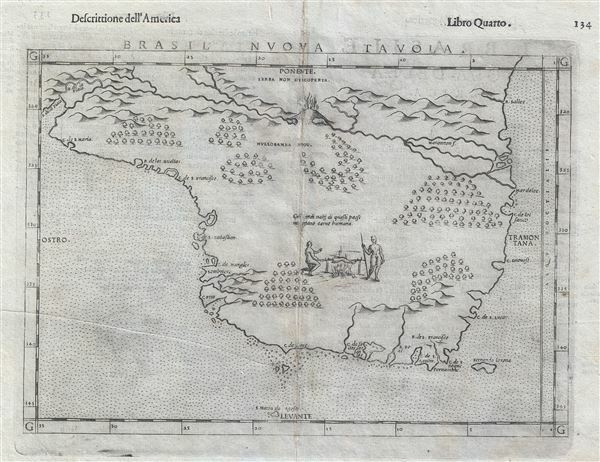 One of the earliest obtainable maps of Brazil and among the first to depict an image of Cannibalism. Printed in 1574 by Girolamo Ruscelli, this is one of the earliest obtainable maps of Brazil. The map is oriented to the west and covers from the Rio de la Plata to the mouth of the Amazon (Maranon) River. Little other detail of the interior is given with the exception of an impressive volcano at the heart of the continent. This map was first issued in 1561. That plate is recognizable by the fact that the pressmark runs off the plate as well as by the absence of the iconic anthropophagi illustration present in later editions. A second state corresponding to the current example was issued in 1574. This was an independent plate and the anthropophagi illustration was added. A third and final plate was issued in 1599. Ruscelli, G., Geografia di Tolomeo, (Venice) 1574. Good. Minor wear and verso reinforcement on centerfold. Typical stitch punctures repaired. Platemark visible. Italian text on verso.